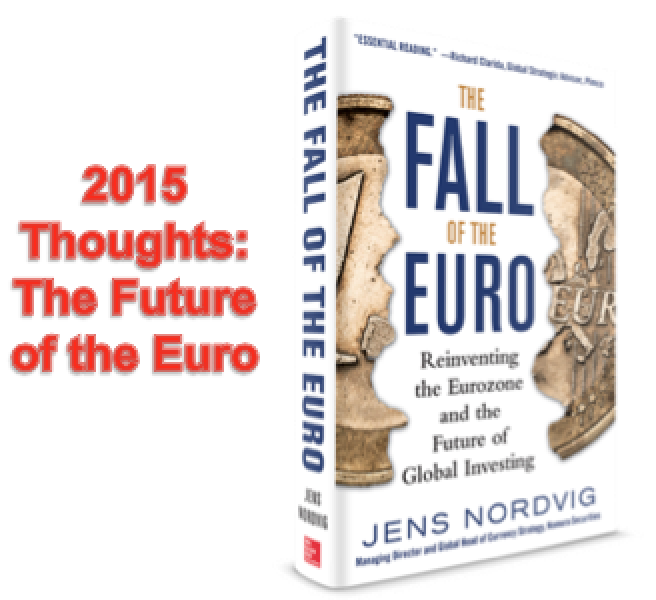 Jens Nordvig | Updated 2015 Thoughts on the “Fall of the Euro” (two years after publication in 2013). Rybczynski Young Economist Prize 2003 – Currency Appreciation in Central Europe – Equilibrium or Bubble? Updated Thoughts on the “Fall of the Euro” two years after publication in 2013. Cost and Benefits of Eurozone Breakup: The role of contract redenomination and balance sheet effects in policy analysis. 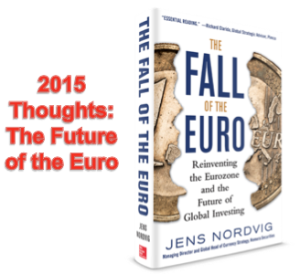 Updated 2015 Thoughts on the “Fall of the Euro” (two years after publication in 2013). I wrote my book about the Euro-crisis and the future of the Euro back in 2013. The book had a dramatic title, The Fall of the Euro: Reinventing the Eurozone and the Future of Global Investing. Rather than predicting the breakup of the Euro (the dramatic cover suggested that), the book argued that the Eurozone’s acute financial crisis of 2010-2012 was morphing into a prolonged economic crisis and that the value of the Euro would eventually fall substantially. The realities of European politics, dominated by a powerful “centrist consensus,” meant that governments would stick to the Euro at almost any cost. But I argued that to reduce financial market tension and stabilize sovereign debt markets it would be necessary to move away from the old “hard Euro,” backed by a very conservative central bank. Instead, the Euro-crisis necessitated the creation of a softer version of the Euro, one supported by a more pragmatic monetary policy. A lot has happened since September 2013, when the book was first published. And now is a good time to take stock. Where is the European economy heading? How does the future of the Euro look now? Below, I will review how six key predictions of the book have faired. I will finish off with some thoughts on the Euro’s future. Prediction #1: The acute financial crisis aspect of the Euro-crisis is likely in the past. When I wrote the book in early 2013, it was already clear that the enhanced backstop infrastructure in the Eurozone (especially the ESM and the OMT) had begun to reduce the risk of severe financial market tension. Two years later, here in early 2015, we are facing essentially the same situation: Financial markets are generally much calmer than during the Euro-crisis years (2010-2012). If anything, the speed at which financial markets have healed is impressive. I had expected a degree of market stabilization, but that sovereign spreads would collapse to close to pre-crisis levels within just 2-3 years of the peak of the crisis . . . that exceeded even my expectations. The best example of rapid healing was perhaps the Spanish bond market. In the summer of 2012, when Spain was experiencing intense capital flight, government bond yields spiked to above 7%. Those yields would drop to below 2% less than three years later (they are now below 1.6%, and still declining). Obviously, not all markets have recovered to the same degree. Greek bond yields have recently risen again, for example. But it is fair to say that credit markets in the Eurozone have improved materially for the large majority of credits. Notably, bank funding markets have generally been stable since 2012, and banks have also been able to raise substantial amounts of equity capital. Linked to this, banks’ lending standards [based on the European Central Bank’s (ECB) lending survey] have started to improve since early 2014. Hence, credit supply is less of an issue, although credit demand may still be holding back overall credit dynamics. Hence, the basic prediction that the most severe tension was in the past proved correct, but, the pace at which government bond markets healed was faster than I had expected. Prediction #2: The economic crisis in the Eurozone would linger long after markets had recovered, and in general internal devaluation would not be a strong catalyst for growth. Following Mario Draghi’s promise in the summer of 2012 to do “whatever it takes” to save the Euro, markets have recovered fairly quickly—even the Euro regained some of its footing from its low in 2012 of around 1.20 to trade at nearly 1.40 in the spring of 2014. But, as I had feared, the economic picture has been very different from market dynamics. The lagged effects of the Euro-crisis (which had seen credit conditions worsen), weak confidence, and more structural headwinds created a cocktail of continued economic weakness. The unemployment rate continued to increase in most countries during 2012 and hit a record of 12% in early 2013, for the Eurozone overall. In late 2013 and early 2014, there were a couple of quarters of slightly better growth. This was in part driven by easier fiscal policy, as the European Commission allowed a number of countries to delay fiscal tightening. (This was decided in the spring of 2013.) But the slightly better growth momentum ran out of steam during 2014 as a temporary boost from inventory accumulation petered out, competitiveness issues in France and Italy took their toll, and the combination of a debt overhang and very low inflation dragged down growth yet again. In addition, the tension in Ukraine, which led the EU to impose economic sanctions on Russia, seemed to have had an affect on Germany and the rest of the Eurozone through the export channel, as well as through confidence effects. Hence, the Eurozone remains stuck in an uneasy equilibrium of continued very weak growth but relatively calm financial markets—2014 GDP growth for the area is expected to be a very disappointing 0.8%, and consensus expectations are around 1% for 2015. After a severe crisis and in the face of unprecedented monetary stimulus, this lack of real recovery is surprising policy makers and putting pressure on governments, which had promised that significantly better times were just around the corner. Meanwhile, “internal devaluation” (the process by which the real exchange rate declines through prices dropping) has proved not to be a magic potion. The experience so far shows that the circumstances dictate whether competitiveness-boosting reforms and wage restraint can have a positive impact. This depends on how flexible wages are, how the export base looks in the first place (openness matters), and on demand developments globally. We have seen Ireland, Portugal, and Spain have some success in terms of expanding their exports and achieving a positive contribution to growth from net exports. But Greek (goods) exports have yet to recover, and the internal devaluation has not even started in Italy and France. Hence, the notion that structural reform and internal devaluation could be sources of growth in the near term (as with “Agenda 2010” in Germany a decade ago) is being questioned by the economic reality. Hence, my basic prediction that growth would remain structurally weak in most European countries has generally played out. Internal devaluation has been a mixed blessing, and certainly not a convincing solution to the Eurozone’s challenges. The tension with Russia has exacerbated the weakness in growth, but it is hard to argue that Russia is the main cause of Europe’s economic troubles. Prediction #3: The inflexible policy framework in the Eurozone, with limited room for both fiscal stimulus and currency flexibility, meant that deflation would be an increasing risk. And in the face of high nominal debt, deflation—which would make it difficult to repay these high nominal debts—would in itself be a driver of growth weakness. I called it the unfortunate “hit ’em while they’re down” effect (page 112). When the book was published, several readers commented that they thought I was too pessimistic on deflation risk. At the time the book was published, headline inflation was indeed clearly positive. CPI inflation averaged around 1.3% in 2013, for example. This was below the ECB’s 2% target, but a distance away from outright deflation. Since then, however, inflation declined steadily, and the most recent inflation figure, published in early 2015, was indeed negative, at minus 0.2% year on year. No doubt, falling oil prices are playing into the headline figure, but even stripping out energy, looking solely at the core figures, they show very low readings of 0.7-0.8% in recent months. This is closer to negative figures than the European Central Bank’s (ECB) 2% target, and it would not be surprising to see further declines in coming months. Moreover, the aggregate figures for the Eurozone hide the fact that the situation is worse in some countries. For example, French core inflation turned negative in January 2015. Finally, the deflationary environment is part of the reason that debt burdened countries continues so struggle with high bankruptcies. In Spain, for example, corporate bankruptcies continue to run at a very high level (more than five times the pace seen before the crisis). High nominal debts and deflation is a dangerous cocktail, and an important factor holding back the recovery. Prediction #4: Political risk would be the key wildcard in terms of the future of the Euro, but the “centrist consensus,” which has always supported the Euro, has proven very hard to shake in Europe. Linked to this, breakup of the Eurozone would not be the central case. Logistically, a breakup would not be impossible to manage, especially if only a small country were to leave. Politically, however, there are very strong forces working against a country’s exit, or any other form of Euro breakup. The Euro remains in one piece. Indeed, more countries have joined the Euro even after the Euro-crisis. Lithuania became the 19th member country when it joined the common currency on January 1, 2015. On the political front, we continue to observe how the centrist forces still dominate. In Italy, the Five Star movement emerged as the single largest political force following the 2013 elections. Nevertheless, Italy now has a majority centrist government, led by Renzi. In Germany, the anti-Euro Alternativ für Deutschland (AfD) party has been gaining in the opinion polls and has gotten representation in local parliaments and the European Parliament. But Angela Merkel has a very strong mandate and her grand coalition government with the center-left SPD does not have to rely on support from any fringe parties. In France, the far-right Front National is ahead in the opinion polls, but the next presidential election is not until 2017, and the party has little direct influence at the moment. At the same time, European politics throw a wildcard into the future of the Euro. Economic performance remains dismal, and that leaves incumbent governments vulnerable, the two best examples being Greece and Spain. In Greece, the SYRIZA party is set, on January 25, 2015, to become the largest party in Greece, according to the latest opinion polls. It would be a historical shift to see a clearly non-centrist force in power in a Eurozone country, opening up the risk of real confrontation with EU partners (including the infamous Troika). For more on this, see my recent article on this on fortune.com. In Spain, where general elections are due in the fourth quarter of 2015, a new and Euro-skeptic political force, Podemos, is the largest party, according to recent opinion polls. The fact that Podemos is less than a year old and has potential to win the next Spanish elections says something about political instability and the unpredictable nature of the European political landscape. The “centrist consensus” has so far been dominating Eurozone politics, from Holland to Greece and from Portugal to Germany. This centrist consensus, which almost religiously supports the Euro, is the key reason why the Euro remains in one piece. But the political tail risk has not been eliminated, and it will remain in place as long as economic performance is falling short of what European citizens deem satisfactory. We cannot rule out that political instability at some point will cause currency fracturing in Greece, Italy, France, or perhaps even Spain. Prediction #5: Markets will increasingly price “an insurance equilibrium” for Eurozone assets. That is, typical country-specific fundamentals, such as debt sustainability metrics, would matter increasingly less for sovereign debt pricing, which would be driven more by the region-wide policy of a more pragmatic ECB. As mentioned, bond yields in Italy and Spain have dropped at express speeds since the summer of 2012. Yields are now at record lows and below 2% for the 10-year bond in both Spain and Italy (and in spread terms, the improvement is similar). Meanwhile, we have yet to see any improvement in debt ratios. According to IMF data, the gross government debt-to-GDP ratio in Italy has had the following trajectory: In 2007, it was 103%. At the peak of the Euro-crisis in 2011 it was at 121%. Since then, we have moved to 127% (in 2012), to 133% (in 2013), and to 137% (in 2014). There is no improvement in sight, as it is nearly impossible to improve this ratio in the absence of growth. Spain is a little different, as growth has improved during 2013 and 2014, but the fiscal deficit is still high, and the government debt ratio continues to march higher. Hence, for Spain the deficit trajectory has been as follows: In 2007, Spain had a moderate debt-to-GDP ratio of 36%. At the peak of the crisis, it jumped to 70%. Since then, it has moved to 86% (2012), 94% (2013), and to 99% (2014). Debt dynamics and yields are no longer linked, as the perceived backstop from the ESM, OMT, and ECB Quantitative Easing (QE) means that investors are again comfortable ignoring (as before the Euro-crisis) country-specific credit risks. The difference is that on this occasion, there may be very rational reasons to divorce investment strategy in individual Eurozone government bonds from the country-specific fundamentals. Believing that the politics of the Eurozone will hold, and that the ESM and the ECB are there to act as backstops, it is rational to believe that we will stay in an “insurance” equilibrium, in which bonds are priced based more on ECB policy than on country-specific fundamentals. We never got explicit Eurobonds with explicit joint liability, but the various backstop mechanisms, including ECB QE, which is just around the corner, mean that we have gotten something similar though the backdoor. What happens if this dynamic continues to run, and deflationary trends make the debt dynamics even more impossible? We cannot rule out that there will be a need for debt restructuring to ultimately address the debt overhang, but European policy makers have no incentive to attack this issue in a proactive manner. Politically, debt restructuring is poisonous, especially since there are tricky legal issues associated with cross-border bailouts. Hence, we can stay in the current limbo for a sustained period of time. Prediction #6: The Euro would eventually embark on a significant decline, based on persistent growth weakness, and a softer monetary policy framework by the ECB. Versus the dollar (linked to better US economic performance), the Euro would eventually break out of the 1.20-1.40 range (held from 2010 to 2014) to the downside. “The crucial policy changes made in the summer of 2012 were a first steps toward altering the key institutional characteristics of the Euro. Crucially, the hard prohibition of central bank financing of government, which had been an underpinning of the original Euro, had been softened” (Chapter 4). The monetary policy framework has indeed softened, but it has gone further than was anticipated in 2012. In the summer of 2014, in an attempt to force banks to lend more, the ECB moved to negative interest rates on deposits. The ECB would now charge banks for the privilege of depositing funds at the ECB. This was further than the Fed, the Bank of England, and the Bank of Japan had gone, signaling that a new and more pragmatic central bank, under Mario Draghi’s leadership, was emerging out of Frankfurt. And now, in early 2015, it is increasingly clear that QE involving large-scale purchases of government bonds will happen soon. Despite German opposition and questions about whether such purchases are consistent with the spirit of the Treaty (which prohibits central bank financing of deficits), such a policy seems only a matter of time. Hence, we are moving farther and farther away from the “hard currency” concept, which originally defined the Euro (and the Deutschmark before that), toward a more pragmatic currency, defined by a central bank willing to engage with non-conventional monetary policy. Specifically, policy communication from the ECB during 2014 explicitly mentioned currency depreciation as a key transmission mechanism from policy easing to better economic performance. My basic prediction appears to be coming true in early 2015: EURUSD has broken the 1.20 level (now 1.1570) on the back of robust economic news from the US and increased speculation that the ECB will expand its balance sheet substantially in 2015. – The Euro is evolving. The currency union is maturing. Institutions are being strengthened. The monetary policy framework is being (appropriately) softened. The Euro is less of a “hard currency” today than before the Euro-crisis. German policy makers may not like it, but the reality is that the Euro today is backed by a much more pragmatic central bank than the Bundesbank ever was. – Financial markets have healed fairly rapidly. From the summer of 2012, when we were looking into the abyss, till today, financial conditions have eased substantially. This is evident when looking at both sovereign spreads and funding conditions within banks. This is not sufficient in itself to generate growth, but it is a necessary condition that is now starting to be met. – The European banking union is evolving. It has been a slow process, and we still lack common deposit insurance, but capital has been raised. The recent stress test, with the ECB as the supervisor for the larger banks, was substantially more credible than past efforts. – The Euro has started to decline. This will eventually provide some support for external competitiveness and net export contribution to growth. As forecast, the Euro has declined substantially (versus the dollar), from around 1.35, when The Fall of the Euro was published, to close to 1.15 today. Further currency depreciation, especially if on a broad (trade-weighted) basis, will eventually reduce deflation risk and support corporate profitability and export growth. – There has yet to be any serious effort to provide a boost to demand. European Commission President Juncker’s infrastructure fund is the right idea (and, in essence, not too far from the mini-Marshall plan advocated in the book), but the size of the fund, in terms of real, fresh funding provided, is too small to really matter. Unfortunately, it will not make much of a difference to GDP growth in the next few critical quarters. Overall, the Eurozone continues to suffer from a very inflexible policy mix. – The politics are tricky, and remain a source of uncertainty. There are threatening non-centrist forces on multiple fronts, and they can evolve in unpredictable ways. Non-centrist forces are gaining ground in Spain and France, and may win the upcoming election in Greece. Meanwhile, we will see how the support for the anti-Euro movement in Germany (AfD) grows after the ECB embarks on QE in coming months. – The risk of a country leaving the Eurozone has not been fully eliminated, even though markets are much more relaxed about the risk and its contagion implications than in 2012. Greece, still in the middle of a drawn-out struggle, may face an intolerable situation later in 2015. A SYRIZA-led government will have to decide whether to confront the Troika and risk being cut off from funding (and see its exit happen by accident), or whether to move toward the center and strike a compromise that will allow Greece to remain in the Euro. – Structural reforms in France and Italy having been piecemeal and have yet to see any real results. The internal devaluation has really not started in those countries. Hence, the second- and third-largest economies in the currency union will remain a drag on overall growth, and debt dynamics there will continue to deteriorate (even if spreads don’t reflect that). – Tension with Russia is creating a fresh risk for the Eurozone. This is currently a significant drag on growth, and a source of anxiety, but, ironically, it may further increase the political support for the Euro, regardless of economic considerations. This is certainly the case in Eastern Europe. – Deflation may have become ingrained, and QE will not make a huge difference. After all, many European bond markets have close to zero yields already . . . . The Eurozone continues to face a dilemma. It is stuck in weak-growth equilibrium with increasing deflation risk due to an inflexible policy framework. But the currency union cannot break away from the malaise, since there is no support for a real political union with common fiscal policy. Meanwhile, monetary policy faces an uphill battle. However, the ECB is trying the best it can, and the value of the Euro has started to fall. A further gradual decline is likely as long as the policy framework does not support growth more forcefully. Meanwhile, political events, if they create doubt about the willingness to cooperate, and the “cross-border insurance” underpinning markets have potential to rock markets and to accelerate the Euro’s fall. Jens Nordvig, January 18, 2015.